Dr Wells cites seven ‘icons of evolution’ that are still portrayed in textbooks long after evolutionists themselves have questioned the errors in them, e.g. peppered moths, Haeckel’s embryos, Darwin’s finches, and claiming that a 1953 laboratory experiment almost created life from lifeless chemicals. Dr Wells said that all the peppered moth pictures were staged; the embryo drawings were faked; the famous finches (which did not in any case influence Darwin’s thinking) showed only temporary variation with no gain of information; the 1953 experiment produced nothing more than impure, dilute amino acids—and evolutionists have come no closer at all to proving abiogenesis (see Life from life...or not? p. 36 this issue) since then. ‘Textbooks have failed to change with the times,’ said Dr Wells. The Washington Times, September 10, 2000, p. C3. Encyclopedias also often continue to use discredited examples in the teaching of evolution. See Encyclopedic ‘truth’ ... or wordly wisdom? Creation 22(4):50–52. Traditionally, most geologists thought that opals were produced over long periods of time. But new evidence suggests that soil-dwelling bacteria could have produced precious opals in a matter of months. Opals have been found at the edge of fossil bacteria (similar to bacteria living in soil today), and it is thought that the organic acids secreted by the bacteria (during their lifetime of a few months) reacted with feldspar minerals to produce opal. Other geologists, however, while agreeing that opals could have formed over short periods of time, believe that physical processes were primarily responsible. 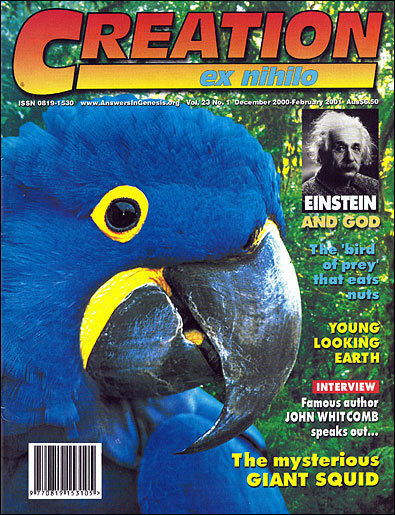 New Scientist, July 15, 2000, p. 7. The geologists seem unaware of opal expert Dr Len Cram’s success in growing opal within a few months see Creating Opals Creation17(1):14–17). Currently popular evolutionary theories suggest that animals would be most likely to ‘adopt’ or protect youngsters they are closely related to, such as nephews and nieces. A gene programming an organism to help close relatives would be more likely to flourish, as these are more likely than non-relatives to share a copy of such a gene. However, a genetic study of polar bears has revealed that cubs recently adopted in the wild were ‘completely unrelated’ to their adoptive mothers. The researchers, trying to reconcile these findings with evolutionary theory, suggest that polar bear mothers ‘accidentally’ adopt other cubs because, being solitary, their ability to identify their own cubs might not be very well developed. New Scientist, May 20, 2000, p. 13. Different species of whale are interbreeding, scientists have revealed. The offspring of a blue whale (Balaenoptera musculus) and a humpback whale (Megaptera novaeangliae) has been seen near the South Pacific island of Tahiti. The director of marine mammal research in French Polynesia said that in two-and-a-half months the strange whale calf has grown twice as large as a normal calf would have done. Ananova, <www.ananova.com/news/story/sm_52193.html>, September 2, 2000. Though classified as different species, even different genera, their interbreeding shows that they are descended from the same original created ‘kind’ and are really a single species. See our earlier article on the wholphin (a false killer whale/dolphin cross) in Ligers and wholphins? What next? Creation22(3):28–33. A well-preserved fossil of an ichthyosaur , 4.5 metres (15 feet) long, has been discovered in a Yorkshire (UK) quarry. The fossil is in such good condition that paleontologists could work out what its last meal was: an extinct squid-like creature. The Sunday Times (UK), August 6, 2000, p. 5. The fact that the stomach contents are preserved shows the ichthyosaur died and was buried quickly—it did not take millions of years—consistent with events occurring during the global Flood of Noah’s day. See picture of the ichthyosaur fossilized while giving birth on p. 10/11 this issue. Interestingly, the largest ichthyosaur found, in British Columbia in 1992, was 23 metres long—nearly five times this one. Following the announcement late last year of the discovery of the ‘earliest fossil fish’ in Cambrian strata (see ‘Slow fish in China’, Creation22(3):38–39), scientists in China have attacked the Darwinian theory of evolution. They argue that neo-Darwinism cannot explain the sudden appearance of all the major animal groups in the fossil record—the so-called ‘Cambrian explosion’. Incredibly, some Chinese officials contend that the theory of evolution is so politically charged in the West that researchers are reluctant to admit shortcomings for fear of giving support to those who believe the biblical account of creation. The Chinese researchers say that the evidence supports a post-Cambrian history of life that runs opposite to standard evolutionary tree diagrams, and suggest that biologists need to come up with entirely new mechanisms to explain the ‘Cambrian explosion’ enigma. The Boston Globe, May 30, 2000, p. E1. In 1994, the discovery of living Wollemi pines in a poorly accessible remote canyon near Sydney, Australia, caused a sensation. Nicknamed the ‘dinosaur trees’ as they were previously known only from fossils ‘dated’ at around 150 million years old, they are now protected from access by all but bona fide researchers (Sensational Australian tree … like ‘finding a live dinosaur’Creation17(2):13; 19(3):7). Six years of research since then has failed to find any differences in DNA between the 40 known adult Wollemi pine trees in two stands, two kilometres apart, leaving evolutionists ‘completely baffled’. According to evolutionary theory, genetic variation is the ‘fuel of evolution’, and therefore low genetic variability is viewed as ‘a fast track to extinction’. Defying this ‘rule’, Wollemi pine trees are remarkably strong, healthy and producing viable seeds and seedlings. All seedlings tested so far have identical DNA to the parent trees. What has most stunned geneticists is that these two stands of Wollemi pine (a third has just been discovered as we go to press) are likely to have been completely independent of each other since ‘the end of the last ice age’—yet both stands share the same genetic code. The Sydney Morning Herald, <www.smh.com.au/news/0007/01/features/wollemi9.html>, September 18, 2000. Overall, this evidence is not what long-age believers would expect or prefer. The secret to the remarkable strength of mollusc shells—which are composed of the brittle mineral aragonite—reportedly lies in their intricate structure. In giant pink queen conch shells (Strombus gigas), layers of tiny platelets are arranged at right angles to each other and held together by a protein ‘glue’. This structure makes shells over a thousand times tougher than pure aragonite crystals, because the platelets dissipate stress into many tiny cracks, instead of one. The researchers suggest this discovery could inspire the development of new ceramic composites which are both lightweight and tough. New Scientist, July 1, 2000, p. 19. British architects have suggested that giant arches, bridges and walls made of artificial bone could be easier to design and build than conventional structures. They have developed a mathematical model showing how to create bone-like structures in whatever shape is required. These would be much stronger than normal constructions, which often have large numbers of components of different mechanical properties, plagued by weak points requiring special reinforcing. The idea was apparently inspired by the remarkable capacity of bones and skeletons to function under large loads and stresses. ‘There’s no doubt the skeleton is more efficient than any man-made structure is going to be,’ observed one researcher. New Scientist, September 16, 2000, p. 7. No surprise, considering who designed it in the first place. High profile American atheist Ed Kagin mockingly refers on his website to the ‘Flat Earth Society’ as if it were a real organisation—presumably comprised mostly of creationists. Not only does the Bible not teach a flat earth (see (Isaiah 40:22), the church in general has never believed it, even during Columbus’ day (Who invented the flat earth? Creation16(2):48–49). Star charts have been discovered painted on the walls of caves in France and Spain. Many well-known constellations of the northern hemisphere, including the Pleiades (Seven Sisters), Summer Triangle, Northern Crown and part of Taurus the Bull, are represented. This discovery of humanity’s early interest in the stars has led researchers to conclude that our ancestors were much more sophisticated than many had thought. BBC News, <news.bbc.co.uk>, August 11, 2000. Cavemen were simply people who lived in caves. They were not ‘subhuman primitives’. It has long been known that each of the two branches of the voice-box of birds can produce sound independently—but in most birds this did not seem to serve any purpose, inviting speculation as to its possible function in the past. However, a purpose for such a ‘dual voice’ has recently been discovered in emperor penguins, which do not make nests and rely on sound to find their mates and chicks in huge colonies. The distinctive ‘beat’ created by combining their two voices is ideal for locating one another in a crowd, because it carries well around obstacles such as other penguins. New Scientist, June 17, 2000, p. 23. Instead, they propose massive and prolonged volcanic activity as a more likely cause, claiming the fossil evidence fits this explanation better than the asteroid theory. Nature, March 9, 2000, pp. 122–123.